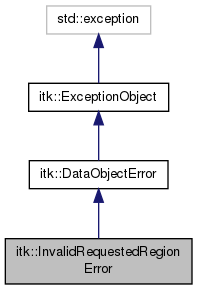 Definition at line 96 of file itkDataObject.h. Default constructor. Needed to ensure the exception object can be copied. Destructor. Need to specify empty throw() to avoid warnings. Definition at line 104 of file itkDataObject.h. Constructor. Needed to ensure the exception object can be copied. Copy constructor. Needed to ensure the exception object can be copied. Operator=. Needed to ensure the exception object can be copied. Print exception information. This method can be overridden by specific exception subtypes. The default is to print out the location where the exception was first thrown and any description provided by the ``thrower''.